And the saga continues with my first trial dog(s). 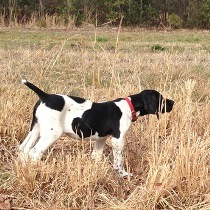 This was Pike's first broke dog stake (Pike is a Pointer - Four Rivers Commander and NSTRA dog). He didn't get to run in derby since Jon Hann (Perfection Kennel) counsels his folks not to run pups with unbroke dogs on birds they could catch. I was a bit nervous for him running in a big dog stake, but he is a year and a half old now, and he's big. Anyway, Jon entered him in Open Gun Dog - and he took a 2nd! I was honestly pretty surprised. Apparently, he had a nice stop to flush as well as 3 finds (sister said he ran like a puppy some of the time, but at other times he was running great). 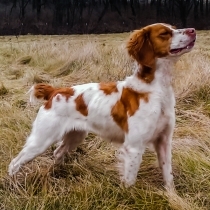 I didn't get to see him run because I was running my sister's dogs in Amateur Gun Dog (which her little female won!). It was a neat Saturday - the Heart of America GSP Club runs a nice trial - and the judges were awesome! My scout (came up from Oklahoma to run his dog) was a great help since I was incapacitated with the flu and barely making it through the day. Would have posted this fun news sooner, but I've been in bed since Saturday as the flu just got worse. My sis's female finished her AFC at this trial with this win. She's a stellar little dog. And in other news....the sister to my sister's stellar little dog, our dog Ginny - is a BHU (Bird Hunters United) National Champion! She and I won the BHU ladies pointing division at Nationals two weekends ago. It was pretty cool to finish her dog the week after her sister became a National Champion. I'll try to get a pic of the two sisters together and post it on here. Great! Love the shot of Ginny on point.